This is an experiment building flat Diamond kites without the usual bowed or dihedral form and keeping the spine unattached to the cross-spar. 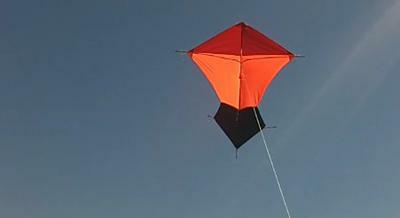 This design combines two Diamond kites: one on top with a loose cross-spar (unattached to the spine) and one inverted Diamond shape kite. The inverted Diamond has a dihedral joint. Photos: Here you have the prototype build with shower curtains (white) and the final product built with ripstop nylon and carbon rods (red, orange and black). Yes, Tim, left alone it would overfly like a Delta. You can't tie it up and fly another kite. 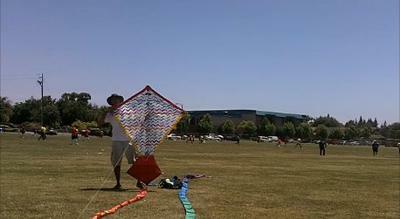 Oh well, still a fun kite. Thanks for the comment. Good photos - I see you are familiar with the 1/3 rule of photography! A really unique concept, getting a large flat Diamond to fly stable with the aid of an inverted one with dihedral. You'd get a few comments about the design if you turned up and flew at a local kite festival. With those carbon spars I bet it flies at a nice steep angle too.